梟 has been regarded as a symbol of lucky which invites Fukui, as a "Fukutoshiro" ・ "" difficulty "・" infertility ", without knowledge of hardships. It is symbolized as an luck thanks to the fact that the auspicious hat is filled. 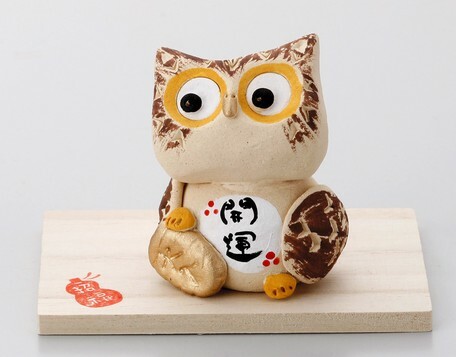 Because of the nature of owl, because the neck turns around with kurukuru, "It will not turn around the neck due to debt, etc." from the fact that it is not troubled by money, business prosperity etc. It is a lucky bird. Many of the work processes are done manually. Therefore, please understand that there are some individual differences in color, size, picture etc etc.